Leigh Halfpenny kicked five penalties from seven attempts. LEIGH HALFPENNY PUT reports of a summer move to Toulon to one side as he kicked Cardiff Blues to a 21-13 home win over Newport Gwent Dragons. Dragons led the home side 10-9 at half-time after Will Harries went over for a converted try on 30 minutes and Jason Tovey added a penalty four minutes later. The Dragons out-half stretched the lead after the break but Halfpenny answered with two penalties of his own to give the fans at Cardiff Arms Park something to cheer about. The turning point of the match arrived on 70 minutes when replacement Blues out-half Gareth Davies swept over a steepling drop goal. 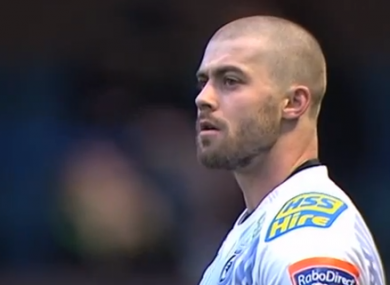 Halfpenny had a chance to make it a two score game with three minutes to go but missed the target. Dragons could not generate any momentum in the closing stages and, frustrated, conceded a penalty. The Blues fullback made no mistake with the final click of the Pro12 encounter. The result moves Cardiff up to ninth in the league. Most of the Blues team played the match with freshly shaved heads after taking part in a head-shaving event to raise money for Velindre Hospital in Cardiff. The campaign was launched under the title ‘Smile for our Captain’, in relation to Blues skipper Matthew Rees’ treatment for testicular cancer. Email “Close shave for Cardiff but Halfpenny proves his worth”. Feedback on “Close shave for Cardiff but Halfpenny proves his worth”.